After a 1 second delay, consecrate an area for 4 seconds, dealing 50 damage every 0.5 seconds to enemies in the area. Each stack of Desperation increases Desperate Plea’s healing by 30%. Passive: Reduce Inquisition’s cooldown by 3 seconds. Searing Lash deals 50% more damage to enemies who are Stunned, Rooted, Silenced or Slowed. Reduce Desperate Plea’s Mana cost by 30. Upon reaching 3 stacks of Desperation, gain a 250 Shield for 5 seconds. Casting Inquisition instantly removes all stacks of Desperation and restores 60 Mana per stack removed. Searing Lash’s first strike restores 10 Mana per Hero hit, and its second strike restores 30 Mana per Hero hit. Activate to gain 50% Spell Power and lose 25 Armor for 5 seconds. 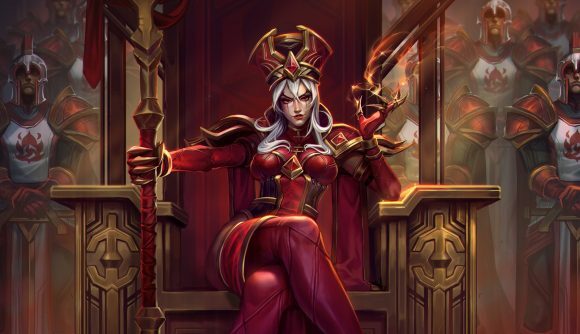 Casting Desperate Plea on an ally heals Whitemane for 125. Does not grant Zeal. Upon reaching 3 stacks of Desperation, all allies with Zeal are healed for 200. Searing Lash’s second strike deals 25% more damage and reduces Searing Lash’s cooldown to 1 second if it hits a Hero. Divine Reckoning deals 50% more damage and pulls enemies to its center the first time it hits them.